Long Beach, Calif. — Epson began shipping two new ultra-sleek wide-format SureColor T-Series plotters — the Epson SureColor T3170 24-inch desktop printer and the SureColor T5170 36-inch floor-standing printer. 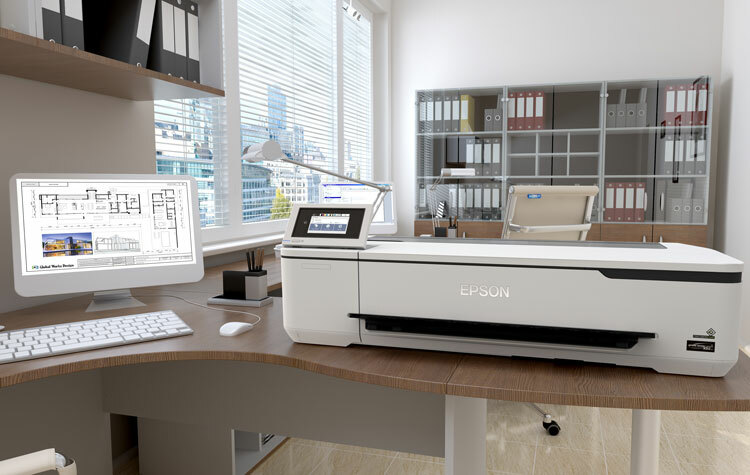 Featuring a clean and compact design and leveraging Epson’s latest printing technology, the SureColor T3170 and T5170 deliver breakthrough print speeds, precise detail and Nozzle Verification Technology to deliver commercial-grade reliability, ideal for creating blueprints, line drawings, signage, or classroom posters. Optimized for professionals in the low-to-mid-range CAD printer market, the new SureColor T3170 and T5170 wireless printers are available now for purchase through authorized Epson Professional Imaging resellers and channel affiliates. Designed to enhance productivity, the SureColor T3170 and T5170 feature integrated wireless and Wi-Fi Direct connectivity1 allowing users to seamlessly print from tablets and smartphones2. Leveraging Epson’s new PrecisionCore MicroTFP printhead and enhanced Nozzle Verification Technology the SureColor T3170 and SureColor T5170 delivers an A1/D-size print in as fast as 34 seconds3, making it the ideal solution for creating blueprints, line drawings and posters. High-capacity UltraChrome XD2 pigment inks deliver durable vibrant prints with brilliant color and crisp lines. The SureColor T3170 (MSRP $995) and T5170 (MSRP $2,395) are available now and offer a standard Epson Preferred Limited Warranty. The Epson SureColor T-Series printers are designed to work exclusively with Epson UltraChrome XD2 ink. For more information, visit https://epson.com/surecolor-t-series-plotters.